This is my truck. Cute, isn’t it? 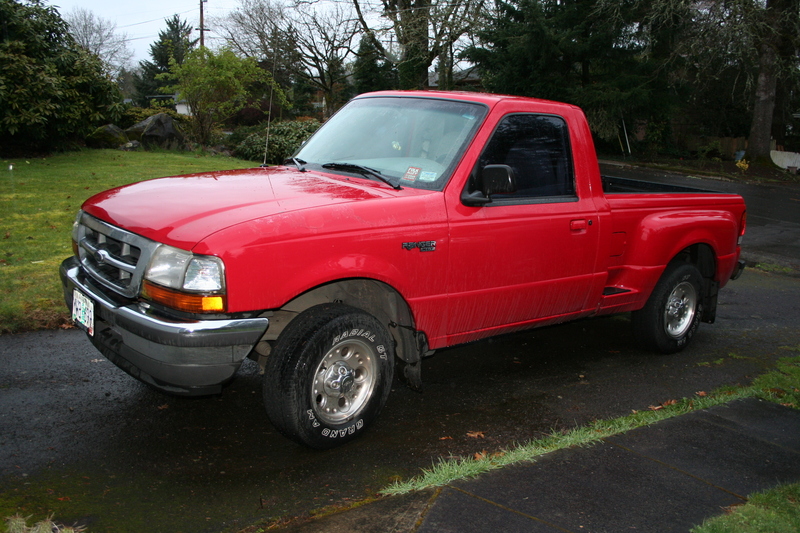 1998 Ford Ranger “Splash”. They didn’t make very many of this model, probably because cute is about all it is. I’m not trading it in. After I get into a reliable car, I want to sock some money away and get the clutch replaced. Then maybe I can work on some other things wrong with it, like broken window seals and that pesky missing radio. Oh, and fixing the heater would be high on the list, too. Right now it just needs an oil change. And a new fuel filter. Or so the guys at Oil Can Henry’s have been telling me for the past three oil changes. Eventually, way down the road, it needs a paint job. You can’t see that in the photo, but the entire right front fender needs repainted. We just want to keep it to haul things in once in awhile. It has come in real handy that way, even if it is a very small truck.